Buttery, spinachy oysters—need we say more? 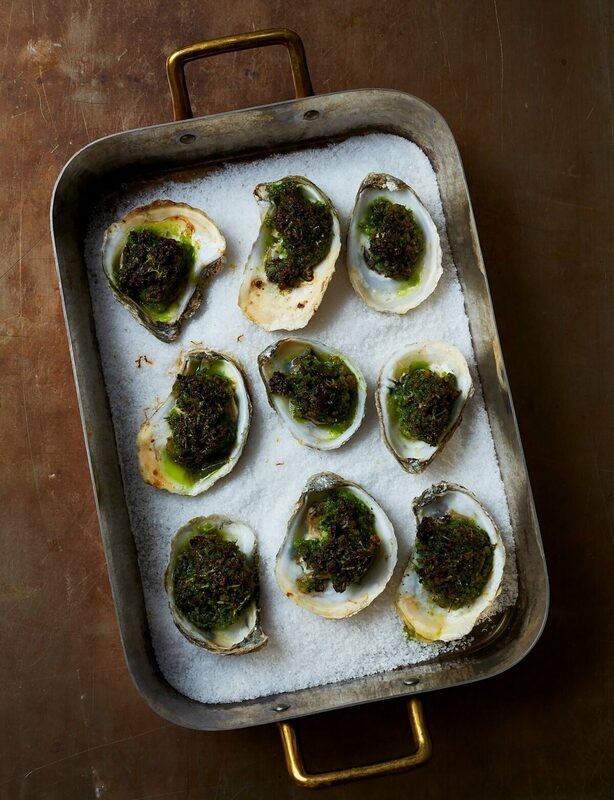 Maybe just this: this gluten free oysters rockefeller dish comes with its own one-slurp serving tray (the shells), making it instantly elegant, especially when served atop rock salt. For effortless service, buy oysters from a trusted fishmonger shucked and put on ice as close to serving time as possible—never beforehand. If you need to get them much earlier in the day, shuck them yourself right before serving. MAKES 12 ROASTED OYSTERS You can make the butter-herb mixture a day ahead, then toss it with the breadcrumbs just before cooking. Position the broiler rack about 4 inches from the heat and turn on the broiler. Spread the salt on a rimmed baking sheet. Separate and rinse each oyster and its shell under cold water to remove any debris. Place each cleaned shell onto the prepared baking sheet and place each oyster in a shell. Refrigerate. In a food processor, process the butter, spinach, parsley, green onions, garlic, shallot, cheese, salt, Pernod, and lemon zest until smooth. Using a rubber spatula, scrape the mixture into a bowl, add the breadcrumbs, and stir until well combined. Remove the baking sheet from the refrigerator. Spoon about 1 tablespoonful of the butter mixture onto each oyster, packing it down slightly. Top each with a little cheese, then broil until the tops are deeply browned, the butter mixture is still green, and the oysters are plumped and firmer, 5 to 8 minutes. If the cheese immediately starts to burn, turn off the broiler and bake at 450°F for the remaining time. Serve immediately with lemon wedges.